To celebrate the 70th anniversary of racing brand Ferrari, Thrustmaster proudly presents the TS-PC Racer Ferrari 488 Challenge Edition racing wheel! Combine the power of Thrustmaster’s cutting-edge technologies incorporated into the TS-PC Racer wheel base, with a replica of the real Ferrari 488 Challenge wheel for an incredibly lifelike racing experience! This officially licensed 9:10 scale replica of the Ferrari 488 Challenge wheel measures 12.6”/32 cm in diameter and is designed for total immersion in the racing competition world of Ferrari. Crafted of polyurethane and the same Alcantara material as that used on genuine Ferrari wheels, the wheel features 15 built-in LEDs and 2 rotary switches for optimal ease of use and efficiency in games. Compatible with the Thrustmaster racing ecosystem on PC (Windows 10/8/7), the TS-PC Racer Ferrari 488 Challenge Edition offers a number of Thrustmaster’s advanced technologies such as the external Turbo Power power supply, Motor Cooling Embedded system, and a highly-responsive 40-watt motor providing enhanced Force Feedback. Designed with hand-stitched wrapping crafted of the same Alcantara material imported from Italy as that used on genuine Ferrari wheels. To provide a high level of performance, precision and comfort for highly-demanding PC gamers, Thrustmaster developed the TS-PC servo base. The industrial-class brushless 2nd-generation motor ensures 50% more dynamics, and 4 times greater stall force than the previous generation. Torque is 1.6 times higher than the torque provided by the TX and T300 RS wheel bases. Very responsive 40-watt motor for particularly dynamic and powerful effects, with enhanced feedback. The TS-PC Racer’s motor provides powerful 40-watt brushless Force Feedback and incredible velocity (dynamic torque): from long stall curves (STALL mode) to super-responsive zigzags (DYNAMIC mode). Maintains dynamics with the new motor by ensuring that there is no overheating, while remaining silent. Provides 50% more dynamics and 4 times greater stall force than the TX and T300 RS wheel bases, plus heat dissipation via monophasic cooling. Field Oriented Control algorithm: H.E.A.R.T (HallEffect AccuRate Technology) provides 16-bit resolution (65,536 values), while the new F.O.C. algorithm dynamically optimizes the response to intense torque demands. The motor responds dynamically and swiftly to increased torque requests, while switching and reducing power drops. External Turbo Power power supply delivers constant power and massive peak power to instantly respond to ultra-fast requests from the game. Toroidal-shaped to optimize efficiency versus heat at 86%, with a finless design. Peak power: 400 watts! 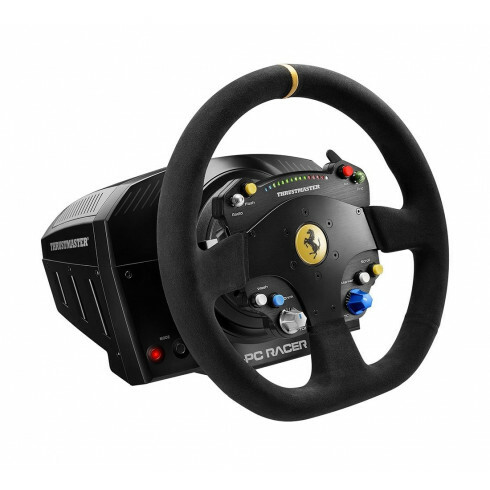 Compatible on PC with Thrustmaster add-on racing wheels (Ferrari F1 Wheel Add-On, Ferrari GTE Wheel Add-On, 599XX EVO 30 Wheel Add-On Alcantara Edition, TM Leather 28 GT Wheel Add-On, TM Rally Wheel Add-On Sparco 383 Mod), and with the Thrustmaster racing ecosystem: Thrustmaster T3PA and T3PA-PRO 3-pedal pedal sets, and TH8A shifter.